As hammers rained from the heavens, The Worthy felt the call of the hammers to bring fear to the people of Midgard. In the Fear Itself comic arc, two of those hammers were picked up by Titania and her husband the Absorbing Man. 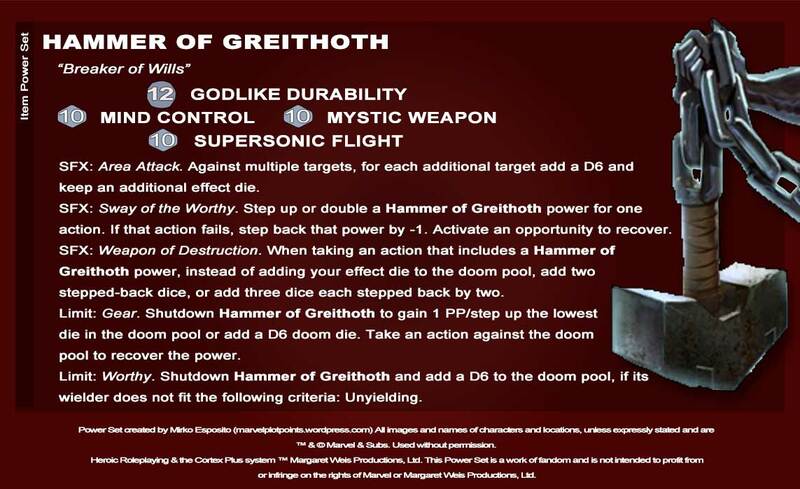 They were transformed by the awesome power of the hammers and became avatars of Skirn: Breaker of Men and Greithoth: Breaker of Wills. In your game, were they found Worthy or was someone else? 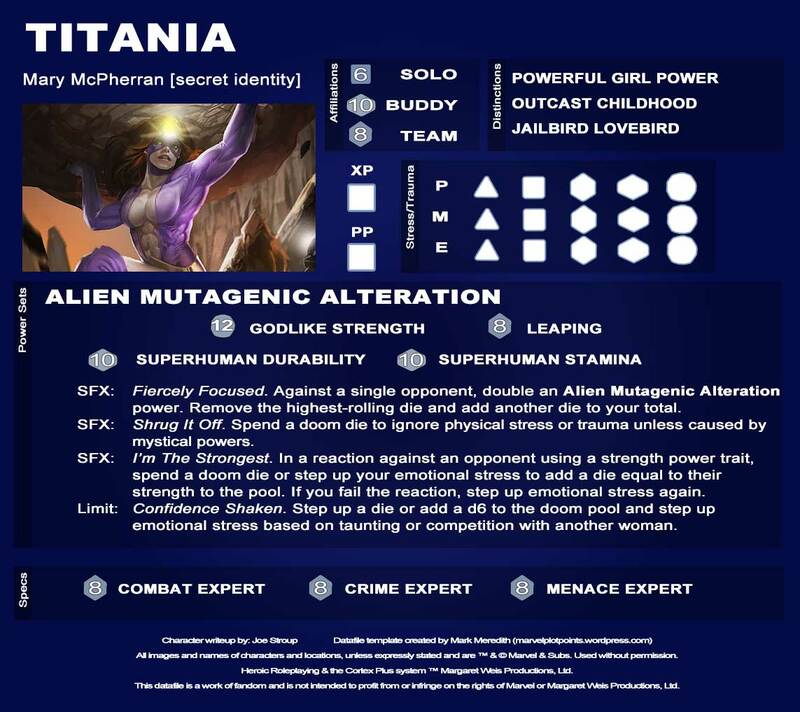 We thought it would be useful to break these up a little bit so we first we have a datafile for Titania without the powers of the hammer. 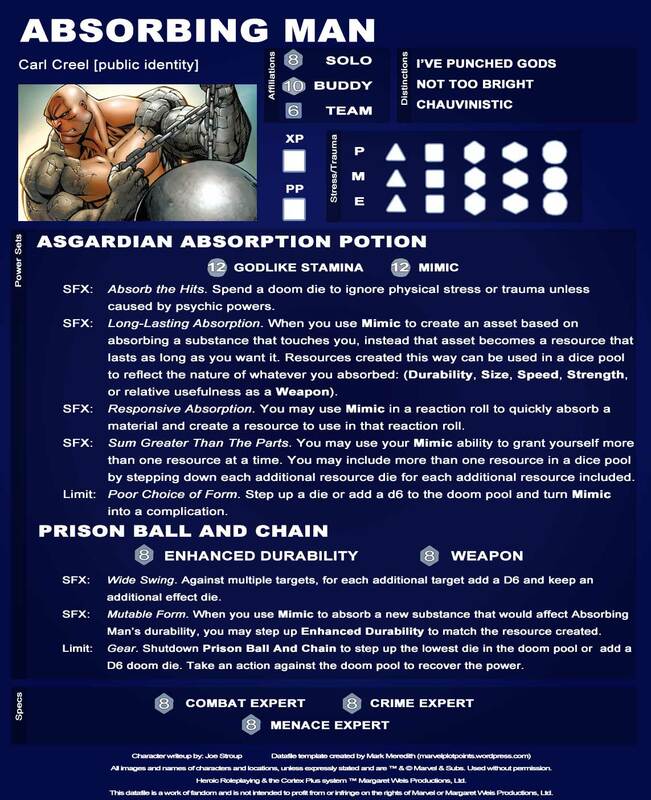 She is a powerful female opponent and long time rival of She-Hulk so it’s great to have her for this event or for getting into trouble with her husband the Absorbing Man as they go on a crime spree that can only be stopped by your heroes. We’ve also got Carl Creel the Absorbing Man in his natural form, which has proven a fighting equal to gods and yet often defeated by lowly street level heroes as well when he is outsmarted. Then we have Titania empowered and possessed by the Hammer of Skirn where she becomes a terrible and fearless foe. Similarly, Absorbing Man is taken by the Hammer of Greithoth, though the two lovers don’t make quite the dynamic pair they used to while wielding their Asgardian weapons. 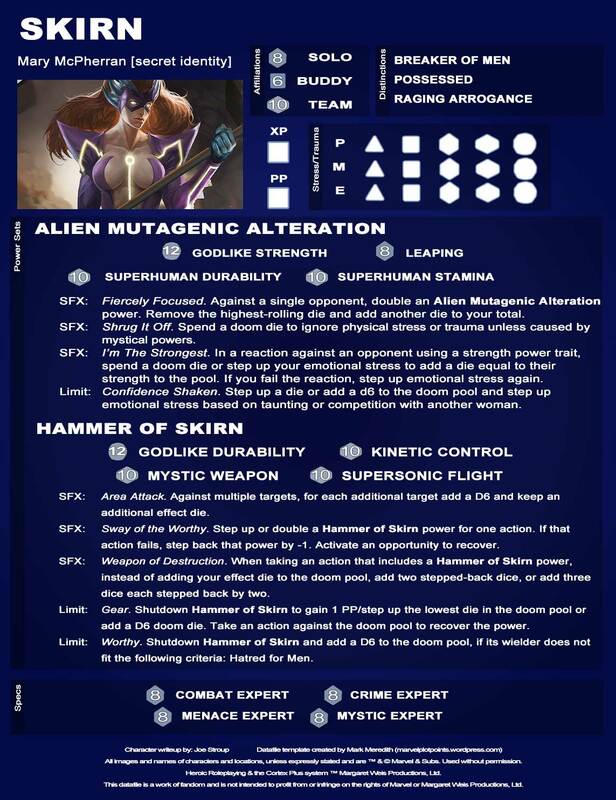 And finally, in your game, maybe Titania or the Absorbing Man weren’t the ones to pick up the hammers, or maybe your players take their hammers from them. For just such a circumstance, we have matching his and hers hammers so you can play out Fear Itself to its fullest and see what happens at your table. Who would wield such terrible weaponry? Who would you have face the heroes while breaking the world for Cul the Serpent? Let us know how it plays out at your table! I don’t understand the final criteria for Worthy. Are those distinctions or just a general consideration unrelated to mechanics? In a word: flavor. If you notice, neither Titania nor Absorbing Man have a Distinction exactly worded as the requirement of their hammer’s Limit. 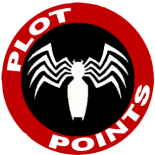 It’s a roleplaying/story-telling detail that the Limits correspond to. The idea from which the limit stems is that the Worthy answer to a call from ancient demons who all serve the Serpent. 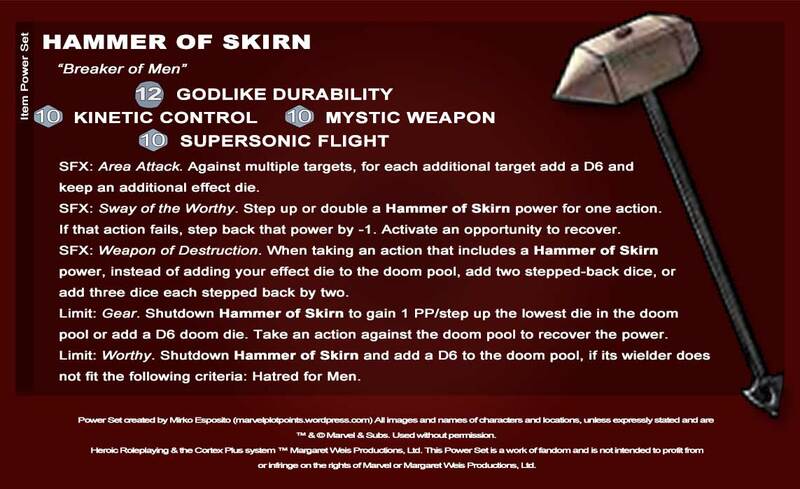 The power of the Hammer comes with a code in the same way that Mjolnir does. It’s hard to come up with a code that could fully describe all the allowed and not allowed behaviours but generally this distinction-like limit will just allow players to shutdown the power set if they are able to smartly defy the effort of a Worthy to fulfill his role. Example: All Worthy have an objective in their scenes (destroying a diamond open-sky mine or destroy the pacific pipeline) and if their intent are thwarted and situation is controlled by heroes, they might have their limit activated. This could open to new development of the scene… will they just escape and reappear after a few more scenes with their “Worthyness” restored or will one of the player seize the moment to put his hands on one of the powerful weapons of the enemy? I hope this answer your question! 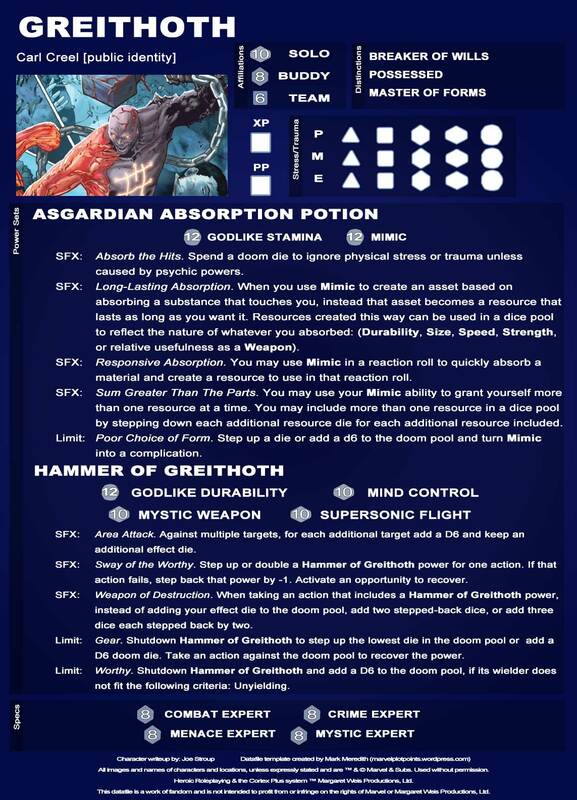 This entry was posted on March 16, 2015 by stroupjr in Asgard, Datafiles, Fear Itself, Item Power Set.